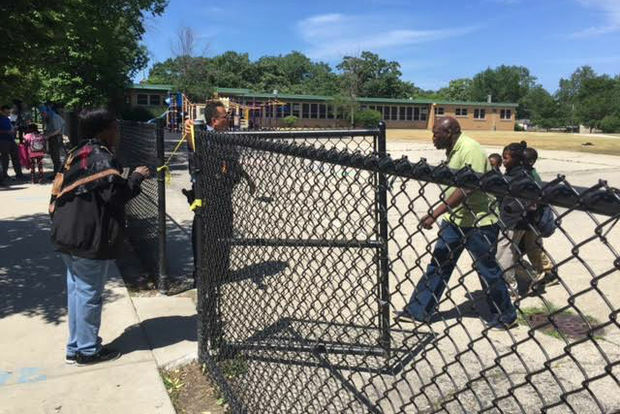 Shortly after 1:30 p.m., some former students at the school at 9239 S. Jeffery Ave. tried to enter the picnic, but school security refused to let them in. The students left, but hung out on the public way, Chicago Police Supt. Eddie Johnson said at an afternoon press conference at the school. A black car, possibly a Jeep, drove up and someone inside fired shots at the former students, police said. They ran into the playground where the picnic was taking place. 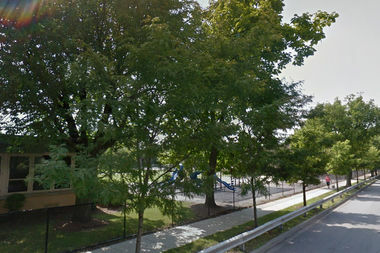 "They drew the gunfire to the kids when they ran into the picnic," Johnson said. 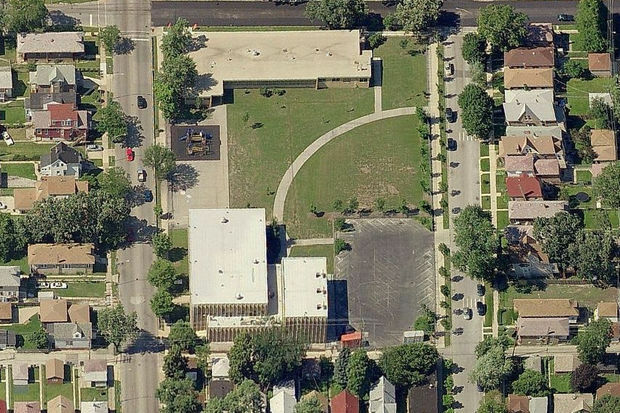 The Warren Elementary school playground in the Calumet Heights neighborhood was the site of a shooting Friday afternoon. The two girls were "unintended targets," said Johnson. The 7-year-old was hit in her right thigh and the 13-year-old was hit in her right hand. The girls were taken to Comer Children's Hospital, and their wounds did not appear to be life-threatening, said Chicago Fire Department spokesman Larry Merritt. Officers stopped a car after the shooting, police said, and several persons of interest were being questioned. Johnson thanked witnesses for helping them pull over the car within five minutes of the shooting. "This makes me sick," Johnson said. "These little kids were trying to have a picnic, and they get shot." Rianna Jackson, who is in eighth grade, said she was hanging out on the the playground before the attack. She was talking with several people who had been expelled from the school and were on the other side of the fence when a black truck pulled up and people inside the car started shooting. The children dropped to the ground, Rianna said. "We all hit the ground," an employee at the school confirmed. "It was a drive-by." About an hour after the shooting, two helicopters flew over the area while a half-dozen officers walked back and forth over the playground. Yellow police tape surrounded the playground. "Is my baby OK? Is my baby OK?" one woman, her hands in the air, asked as she ran under the police tape. Other parents ran up to officers, asking if their children were OK, while children left the school. Giara Witiker, who is in the second grade, was outside during the shooting and she heard the shots. The school has practiced what to do in case of a shooting, Witiker said, so she was prepared. "I thought it was firecrackers at first," she said. Witiker's brother, third-grader Krishna Grant, said he was inside his classroom when the assistant principal turned off the lights and locked the door. "I was scared and started crying," he said. "She prayed for us." Tatianna Smith, who was picking up her niece after the shooting, said gun violence isn't common in the area. "It's so sad they are shooting into a crowd of children," Smith said. Johnson confirmed that shootings weren't typical in the area around the school. CPS Chief Executive Forrest Claypool said Mayor Rahm Emanuel was visiting the children at the hospital. "I've known the mayor for 30 years. I've never heard him this angry," Claypool said. He said security would be increased at the school for the last two days of the school year, which ends on Tuesday. At least 12 other children 13 or younger have been shot so far this year citywide. Even for children who survive shootings, the city's violence can have a lasting impact, experts say. Children who have suffered trauma like a shooting are more likely to have physical and mental health issues later in life. They may even experience developmental problems because they live in constant "fight or flight" mode. At the same time, organizations that help traumatized children have seen their resources cut.